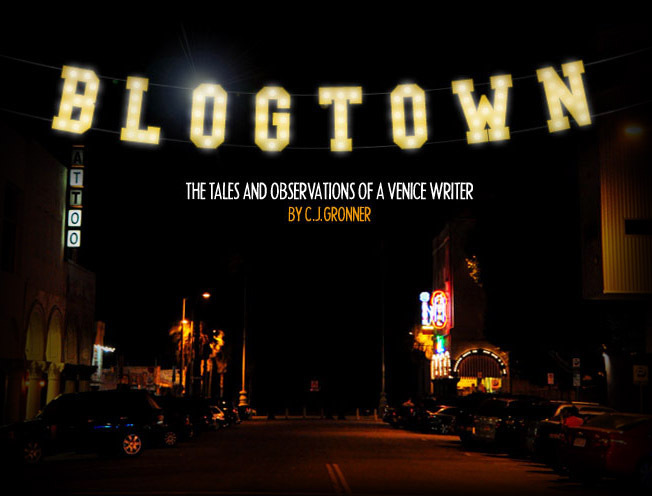 Blogtown: Abbot Kinney Street Festival 2009! Last Sunday was the Abbot Kinney Street Festival, or as we like to call it, Venice Christmas. Homecoming is probably more apt, as you see everyone from town, people that used to live in Venice, people that haven't been to the beach since last Street Fair, and best of all, your friends and family that have a great excuse to go nuts all day. It was all socked in with fog for much of the day, but rather than be a drag, it was kind of nice to not be squeezed in with thousands of sweaty people that have been drinking in the sun all day. Instead, it was perfectly temperate, both weather and mood-wise. They really do have the best location on the block for Street Fair - right across from The Brig stage, optimum people watching. I saw a man in an Eagle costume dancing, and his enthusiasm was to infect us for the whole day. I dug his dance style too. We saw a few bands from our fresh roost, including pal, Peter Goetz, and his crew grooving up the passers-by with their surf-style rock. The danger of such decadence and fun with friends, is that you can end up staying too long and missing out on the Festival. We did stay until the champagne ran dry ... and then it was out into the on-ramp of the flow. You couldn't walk three feet without seeing a friendly face you knew - or meeting one you didn't. The booths seemed to be more home-made and cool stuff than in recent years, especially my homegirl Denise's badass belt buckle booth (Denise Saffren Belt Buckles) - this year with an actual grass table to lure in the masses in. Check out her new one, "Legalize It". I think it should be a big hit with the local crowd. And that led us into The Green House Smoke Shop to greet our familia there on our favorite holiday. I was sporting my Abbot Kinney shirt from Firefly all day, and it was a big hit. Though an Australian friend wondered why I was wearing a t-shirt of Ned Kelly. He also said, and I think this might've summed up the entire day/experience/town - "Everyone is so colorful in Venice." I stopped by to check out Erinn and the Firefly ladies - stunning as ever. You do almost wish the Festival was a couple day thing, as there are too many people to talk to, too many things to see, bands at opposite ends of the boulevard so you have to make choices, and I always just enjoy more of a good thing. The lines were crazy long for the food vendor booths, so Steph and I threw down some good ol' Glencrest BBQ for our survival needs, before heading to meet up with our Little Radio gang at the Brooks end of the hoopla. Hula Hoopla, if you asked the kids. All the worlds collided down there - it seemed that EVERYONE smushed down to that end for the highly anticipated closing act of Edward Sharpe & The Magnetic Zeros. And for good reason. They put on a SHOW. I think his eyes popped like that when Edward Sharpe's shirt came off. But it might have been because the band is so full of life - and instruments. I said pre-show to Mrs. Little Radio, Christina Conway, "It seems like everyone we know knows someone in this band" and she said, "That's cause there's like 10 people in it." She ain't lying. There's about three guitars, a bass, a pretty accordian girl, Edward Sharpe shaman-ing about (he's like a cross between Devendra Banhart, Wayne Coyne, and The Polyphonic Spree guy - with a samurai top-knot), a girl he looks at lovingly while he sings with her (actually, the entire band looks at each other affectionately while they play - and it's infectious), a drummer, a couple of people on shakers and other percussion, a horn player, and who knows whom else sneaking around, but the parts make up a beautiful whole. The voices mesh beautifully, and the instruments - especially that horn - made it feel so super celebratory. I said to Steph, "Do you think they all live in Silver Lake?" She answered only, "Yes." My favorite of their all crowd-pleasing tunes was "Home". The whole attendance of the Festival was clapping along it seemed, and I would not have been the least bit surprised if it had broken out into musical-like dancing as one down the street into the sunset. Up With People!! That's what it felt like. "Home is wherever there is you!" Exactly. It was sort of a stage in the square, as revelers surrounded the stage on all sides. It was a sense of total community, and a celebration of exactly that. I must insist that you check out ESATMZ's as soon as you possibly can. They're about to blow UP, and you should be in on it. Despite the happy crowd's begging and clapping, and it seeming like it was about to work - the Fire Marshall stepped in and said, "Thank you for coming, see you next year." Not even one more little short song ... Sticklers. Little Radio was having a big old After Party, tons of friends were heading in different directions (me and mine were headed directly to the home of our friend Jeffrey, who had Chef Mikey Wilson grilling up eyes-rolling back delights up on the roof), and as you walked or rode (which I hope you did) through the neighborhoods, you could hear music and laughter drifting out across pockets of the whole town. Magical. Once again, why we live here. Late night, stuffed and satisfied, we rode our bikes back home down the still closed-off Abbot Kinney Boulevard (I actually like the idea of it always being closed off, like a power Walk Street). The dismantling of another special day was in full effect, with clanging poles, direction shouting and garbage trucks moving in as the soundtrack now. Even the cops were all smiles this evening ... hey, no shootings this year! I didn't even hear of any fights! Gold Stars for everyone!! I commended the Officers on a job well done, and it seemed like they weren't sure if I was being a smart alec or not, but I wasn't. Peaceful coexistence ... one day at a time! I love it. And I love being a part of a neighborhood that above all else, knows how to celebrate itself and its inhabitants. Up with People! UP WITH VENICE!! Dig.